The instant I saw this stitch pattern, I fell in love! The strong, sinuous lines just beckoned to be made into a pair of socks. 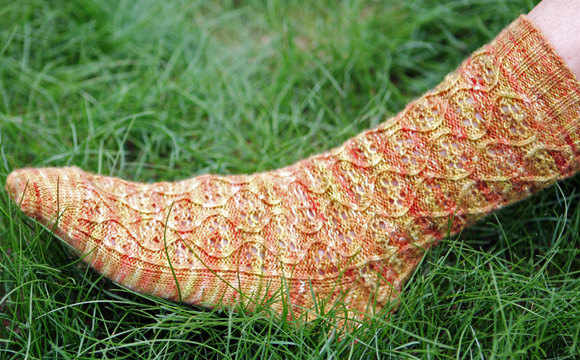 I had just dyed up several new colorways, and the variegated one pictured begged to be knit in this pattern. After knitting the socks, top down, the pattern continued to enchant me, and I just had to see what they would look like in a ‘Just About’ solid yarn. I am thrilled with the way the lines carve out their pattern and travel down the leg and foot. 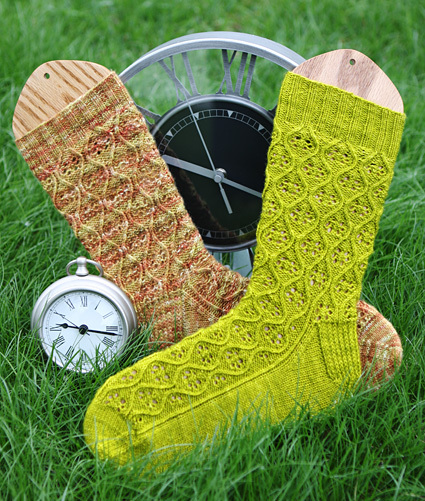 I particularly like the one twisted knit stitch on the sides that flows out of the pattern and down the foot to visually separate the top of the foot from the bottom. The stitch pattern to me suggests hourglass timers, and thus the name. Dyeing info: PRO Chemical's Wash Fast Acid dye - comes in 2 oz packets, each packet provides dye for many pairs of socks. For the green pair, a mixture of Sun Yellow #119, Black #672, Brilliant Blue #490. For the brown pair, a mixture of Mahogany #508, and Black #672, Brilliant Blue #490. 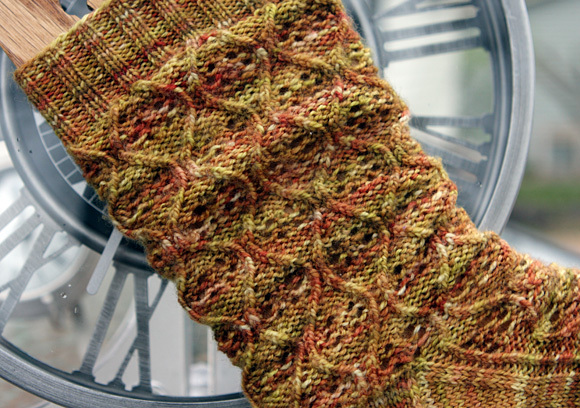 Socks are worked top down on two circular needles, starting at the cuff, and ending at the toe. SK2P: Slip 1, k2tog, pass slipped stitch over. Left cross with twist: slip first stitch to cable needle and hold in front, purl the next stitch, ktbl the stitch from the cable needle. Right cross with twist: Slip first stitch to cable needle and hold in back, ktb the next stitch, purl the stitch from the cable needle. CO 68 stitches. Place 34 stitches on each of the two needles, and join to begin working in the round, being careful not to twist. Round 1: [K2, p2] to end. Repeat this round until work measures 1.5 inches, increasing 1 st on each needle on the final round, to 70 sts total. Next Round, establish pattern stitch: Work round 1 of pattern stitch chart. Pattern is worked 7 times in each round. Work round 2 of pattern stitch chart. Work Rounds 3-22 of leg chart 3 times, and then rounds 3-12 once more. This will give a leg length of about 7.5 inches. Additional rounds can be worked for extra length, if desired. If you do this, make a note of the last chart round worked before starting the heel so you know where to pick up the pattern after working the heel. To setup for the heel, rearrange the stitches: Work the first two stitches from the first needle, in pattern, onto the second needle; then slip the first two stitches of the second needle to the first. The second needle should start and end with [p, k tbl, p] and you should again have 35 stitches on each needle. The first needle will be now referred to as the Heel Needle, and the second needle will be referred to as the Foot Needle. This portion is worked flat, in rows. Row 2 [WS]: Slip 1, p33. Row 3 [WS]: [Slip 1, k1] to end. Repeat Rows 2 and 3 until you have a total of 32 rows, ending after a Row 2. Row 1 [RS]: Sl 1, k19, ssk, k1. Turn work. Row 2 [WS]: Sl 1, p7, p2tog tbl, p1. Turn work. Row 3 [RS]: Sl 1, k8, ssk, k1. Turn work. Row 4 [WS]: Sl 1, p9, p2tog tbl, p1. Turn work. Row 5 [RS]: Sl 1, k10, ssk, k1. Turn work. Row 6 [WS]: Sl 1, p11, p2tog tbl, p1. Turn work. Row 7 [RS]: Sl 1, k10, ssk, k1. Turn work. Row 8 [WS]: Sl 1, p11, p2tog tbl, p1. Turn work. Row 9 [RS]: Sl 1, k12, ssk, k1. Turn work. Row 10 [WS]: Sl 1, p13, p2tog tbl, p1. Turn work. Row 11 [RS]: Sl 1, k14, ssk, k1. Turn work. Row 12 [WS]: Sl 1, p15, p2tog tbl, p1. Turn work. Row 13 [RS]: Sl 1, k16, ssk, k1. Turn work. Row 14 [WS]: Sl 1, p17, p2tog tbl, p1. Turn work. Row 13 [RS]: Sl 1, k18, ssk, k1. Turn work. Row 14 [WS]: Sl 1, p19, p2tog tbl. Turn work. 20 sts remain. Row 15 [RS]: Knit. With Heel Needle pick up and knit 1 st for every 2 rows worked on the first gusset side (16 sts). Pick up and knit 1 st in the corner between the last picked up st and the first st on the Foot Needle (17 sts). Place marker to denote start of round. Continuing to use the Heel Needle, work across 13 sts in pattern from foot chart, Round 11 (or if, you lengthened the leg, start from wherever you left off). 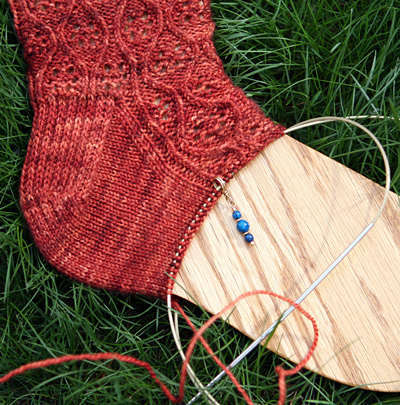 Now slip 10 of the 20 heel sts from the Heel Needle to the Foot Needle. Using the Foot Needle, work across remaining 22 pattern sts, place second marker, pick up and knit 1 st in the corner, pick up and knit 16 sts along edge of gusset, and knit 10 previously transferred heel sts. 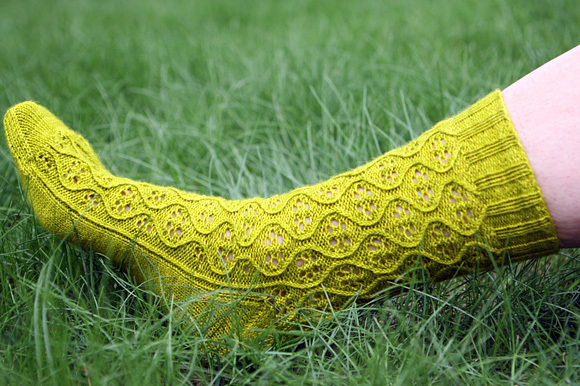 You now have 35 patterned instep sts and 54 (27 per needle) gusset/sole sts. Next Round: K10, k tbl 15, k2tog tbl, sl m, work next round of chart , sl m, k2tog tbl, k tbl 15, k10. (26 per needle gusset/foot sts). First Gusset Decrease Round: K23, k2 tog, k1, work next round of chart, k1, ssk, k23. Next Round: K25, work next round of chart, k25. Continue to repeat these two rounds, decreasing one st each side of gusset every other round until a total of 34 foot sts remain (18 on each needle). Continue to follow chart for a total of 4.5 repeats, or until foot measures desired length before toe decrease. Continue to repeat these two rounds, decreasing one st each side of both markers until a total of 12 sts remain. Rearrange sts so that there are 12 on each needle. Use Kitchener stitch to close the toe. I have been a passionate knitter for 50 years. I was taught by my Grandmother, who knew only the knit stitch. She lived on a small farm in WI. The summer I was 5 years old I got to spend a week with my Grandparents ‘on the farm’. She was the definition of frugal; knitting needles and yarn were a luxury she could not indulge in. She actually taught me using packaging string she had saved on a large ball and two ‘hand-made needles’ from scraps of wood from my Grandpa’s wood shed. I was instantly infatuated and have proceeded, over the years to continue to teach myself further skills. Everything I knit is designed from scratch, starting with drawings to try and capture the idea, then to my stitch library for inspiration, onto swatching, and then actual knitting. 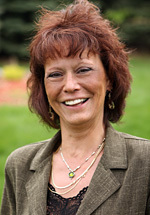 In ‘real life’ – I was a research chemist for about 20 years, and now am in sales.